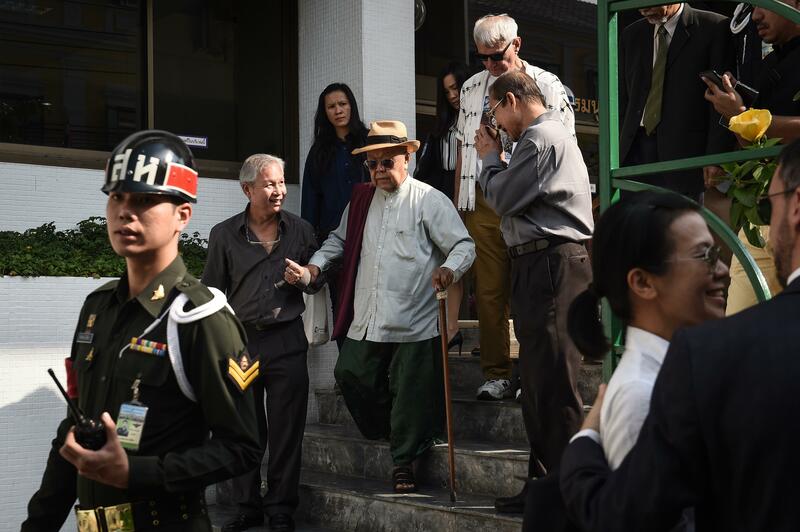 BANGKOK -- A Thai military court on Wednesday dropped royal insult charges against an 84-year-old historian who questioned whether a Thai king had actually defeated a Burmese adversary in combat on elephant-back over 500 years ago. Sulak Sivaraksa was charged in October under the draconian lese majeste law that protects the monarchy from libel and defamation. The Bangkok military court had agreed to hear views from historians and experts before it decided to drop the charges for lack of evidence. Sulak, a veteran academic and proclaimed royalist, said he had petitioned Thailand's new king, Vajiralongkorn, for help in dropping the charges against him. "I contacted many people for help but no one dared to. So I petitioned the king. If it weren't for His Majesty's grace, this case would not have been dropped," he said. His case stems from a 2014 university lecture when he told the audience to "not fall prey to propaganda" and questioned whether King Naraesuan had really won the 1593 battle by defeating a Burmese prince in solo combat mounted on a war elephant. The story is one of Thailand's most celebrated historical feats and the date of the combat is marked each year with a military parade on Jan. 18. Insulting the monarchy is punishable by three to 15 years in prison. The law in writing appears to only protect the king, queen, and heir apparent but in practice the rules are more widely interpreted. Thailand's military government has been criticized for its frequent use of the law to silence critics since it seized power in May 2014. The law has been widely condemned including by rights groups and the U.N., which has called for it to be revoked. Some 100 cases of lese majeste have been prosecuted since the coup, according to the legal aid group Thai Lawyers for Human Rights. Sulak has often criticized the lese majeste law and has faced at least five previous charges. "In a dictatorial regime if people want to express opinions, to have freedom of speech, you have to be punished," he said. "And this is not the first time I have been punished."